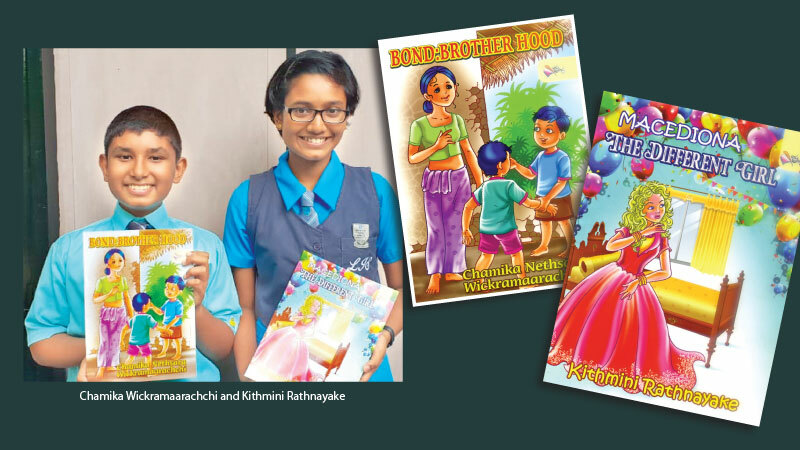 Two students of Lyceum International School, Gampaha, had published two children’s books. Chamika Nethsara Wickramaarachchi’s book is titled ‘Bond: Brotherhood’ while Kithmini Rathnayake’s book goes as ‘Macedonia – The Different Girl’. Both books have been published by Guru Gedara Book Circle. ‘Bond: Brotherhood’ is Chamika’s second story book. The story portrays the hardships of a poverty-stricken child. Chamika had to get into the shoes of a child who have been deprived life’s luxuries to pen this tale. He has realized that not all are equally fortunate and that it is important to give and make life better for the less fortunate. ‘Macedonia – The Different Girl’ is about a little girl named Macedonia who is able to communicate with animals. Both these slim bound books comprise colourful illustrations which pleases the eyes. Both stories are well written, describing minute details in a colloquial manner so that young readers can follow the sequences easily. The two youths have been able to drive their message through to the readers and instill the values embodied in the stories in their minds. These are not merely fantast stories or fairy tales but stories which have much substance. Therefore they cultivate the emotional growth in young minds. Gifted with the skill to express themselves via the pen, both Chamika and Kithmini have managed to deliver their messages to the world in a skillful and meaningful manner.